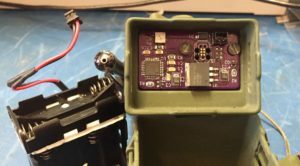 It’s about time that I wrote a quick blog post about the 6m fox hunt transmitter that I made for Military Radio Collectors Group events. I made it out of an AN/PRT-4A transmitter. From the outside, it looks unmodified. But on the inside it has a few changes! I started with a refurbished AN/PRT-4A transmitter, which I purchased from C&H Surplus a few years ago. I don’t know if they have more left. 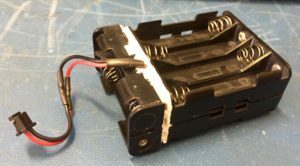 I designed a small board which mounts on the bottom of the main housing in place of the original battery connector. This board includes a microcontroller with enough flash memory to store a short audio message. There’s no built-in message recording capability; it’s necessary to use arcane magic to include the message in the firmware image for the microcontroller. Remove original chassis wiring harness. Remove return spring from the butterfly switch, so it does not return to the off position when released. Install new PCB on bottom of the chassis, and wire everything together.